Figure 1. 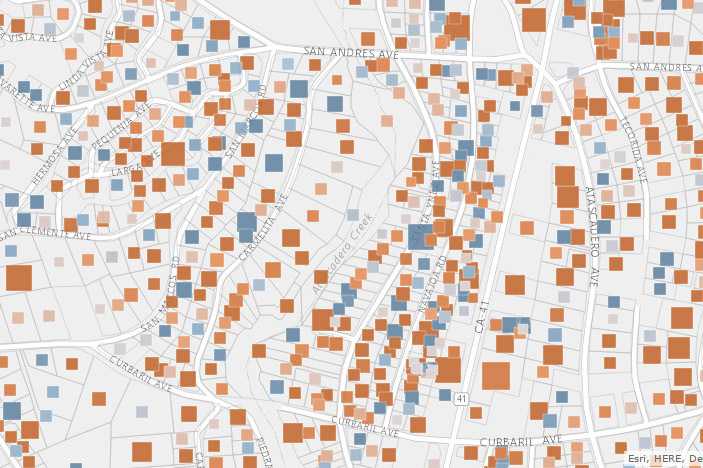 This map of water usage in Atascadero, California, shows areas that used more water in blue and areas that used less water in brown. ArcGIS contains many basemap-specific color ramps to help showcase your data. Many of these ramps are friendly to color-blind readers. When you switch the basemap, smart mapping automatically suggests a color ramp suitable for the basemap you select. The Light and Dark Gray Canvas basemaps are designed to draw focus to your data and are a good place to start. To enhance your story, choose an alternative color ramp that matches the context of your data. For example, the map in Figure 1 shows change in water usage in Atascadero, California, after the California governor proclaimed a 25 percent mandatory reduction in water usage. Areas in blue used more water after a year, while the areas in brown used less water. These colors are directly associated with the story being told. 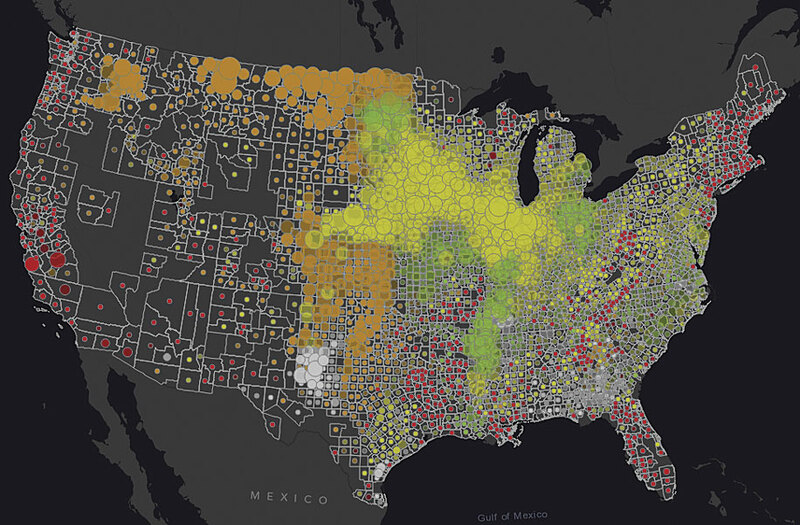 When mapping thematically, try changing the theme to see your data in a new way. Try using Above and Below or Centered On options. Mapping something with important high or low values? Try High to Low or Extremes. 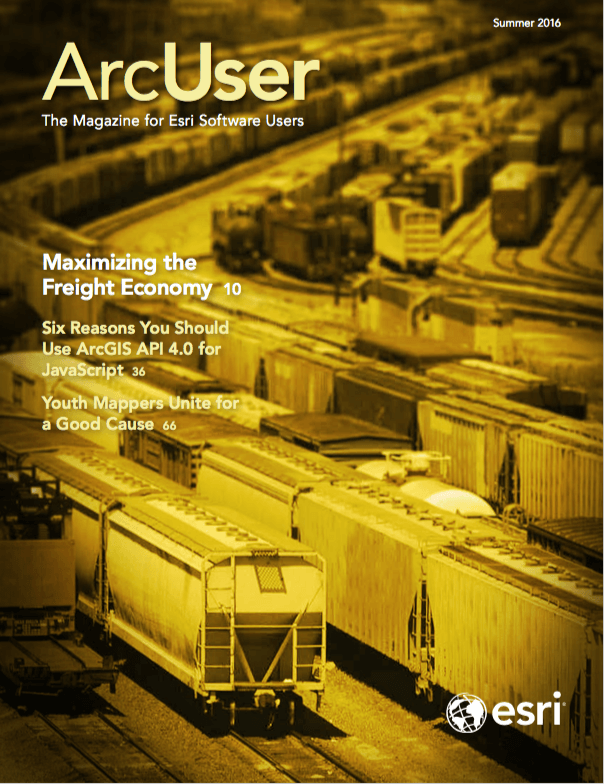 Each theme has color ramps designed for use with that theme and the current basemap on your screen. Click a color ramp to see how it looks. Then think about your audience—do the map’s colors give the first impression you want them to give? 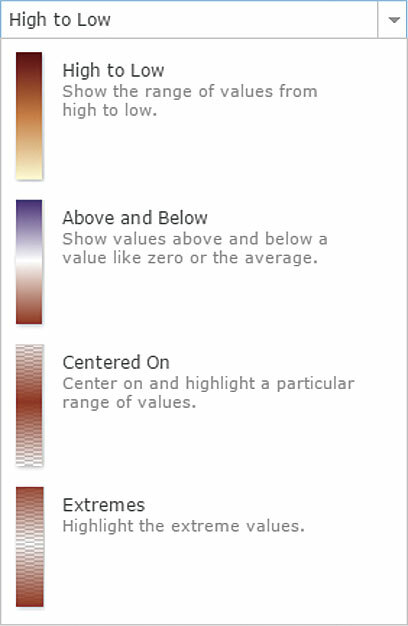 See color ramp choices. Figure 2. If you want to use size to represent values in your data, an easy way to discover and show patterns is to drag the lower handle to the average value. The patterns within your data need to be revealed. Whether you classify your data or use an unclassified approach, be deliberate in how you assign color or symbol size to the data. Choose values that make your message clear. To find patterns in your data, use the handles within the histogram to adjust the map quickly. If you want to use size to represent values in your data, an easy way to discover and show patterns is to drag the lower handle to the average value (as shown in Figure 2). This will emphasize any values that are above average. 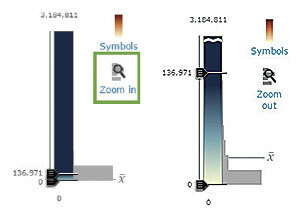 To get the average value, hover over the x-bar value to the right of the histogram. You can also type the exact value into the lower handle by clicking on the number near the handle. 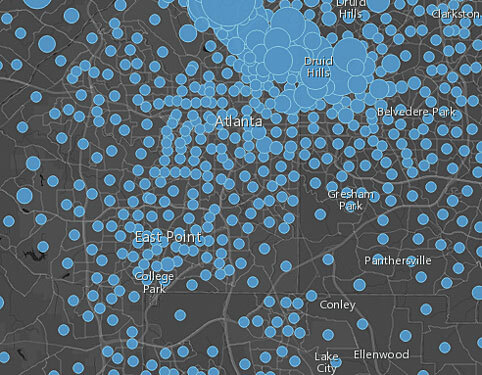 The maps in Figure 3 show the average household income for Atlanta, Georgia. The first map uses a continuous ramp through all values of the data, while the second map starts showing larger circles only once a value is above average (the technique just described). 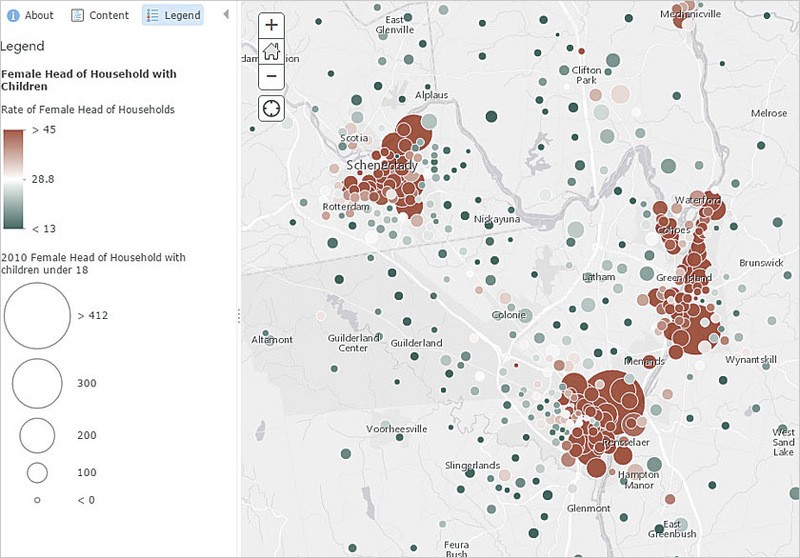 In comparison, the second map shows a more definitive pattern of above-average incomes in the Druid Hills area. Have an outlier in your data? Zoom in to see the values closest to the mean in the histogram. Pull the handle away from the outlier value to see how it affects your map. 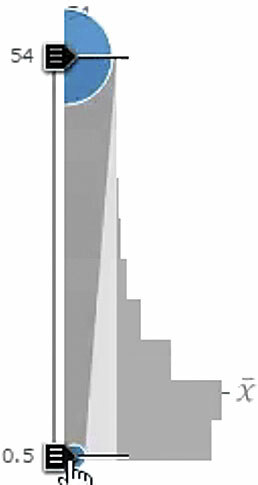 View histogram. Figure 3: This maps show the average household income for Atlanta, Georgia using a continuous ramp through all values of the data. 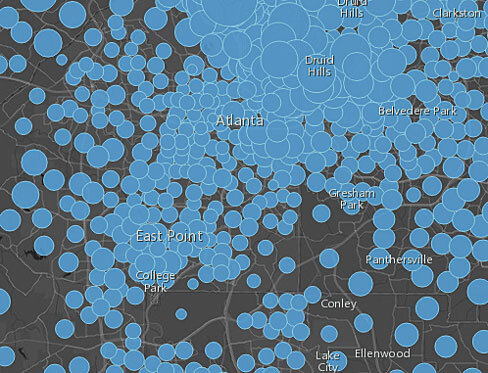 Figure 3: This map shows the average household income for Atlanta, Georgia using large circles once a value is above average. Outlines on points and polygons sometimes become distracting and tear your audience away from the focus of your map. An easy way to maintain their importance while drawing attention to the map topic is to play around with color and transparency on boundaries or outlines. For example, change your boundaries or circle outlines to a slightly transparent value or a color similar to your basemap. You can even try full transparency if the boundaries or outlines don’t help support your story. The map in Figure 4 shows an example of overbearing boundaries, while the map in Figure 5 uses transparent circle boundaries using a color similar to the basemap. The patterns within the data become more distinct and comprehensive. You can see how strong outlines actually interfere with the pattern the map wants to reveal. Widen the gap between the highest and lowest value to get a more intense transparent effect. The maps in Figure 6 show the subtle difference achieved by using transparency. 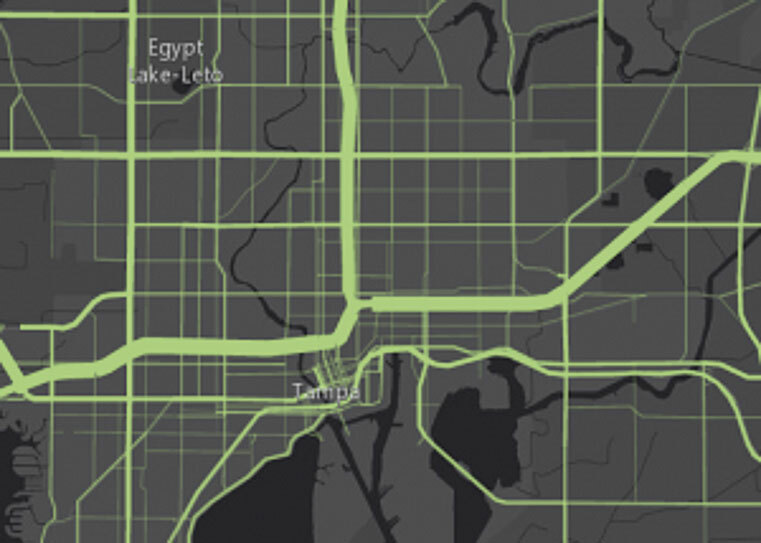 The second map uses the same attribute for size and transparency, revealing the busiest highways in Tampa, Florida, by letting less busy roads recede visually into the map (due to data-driven transparency). See how to set transparency. Figure 4: This map shows how strong outlines actually interfere with the pattern the map wants to reveal. Figure 5: This map uses transparent circle boundaries in a color similar to the basemap, which makes patterns within the data become more distinct. Transparency can add emphasis to the patterns in your data. Whether you want to highlight a pattern or a statistically significant value, transparency makes patterns more understandable. 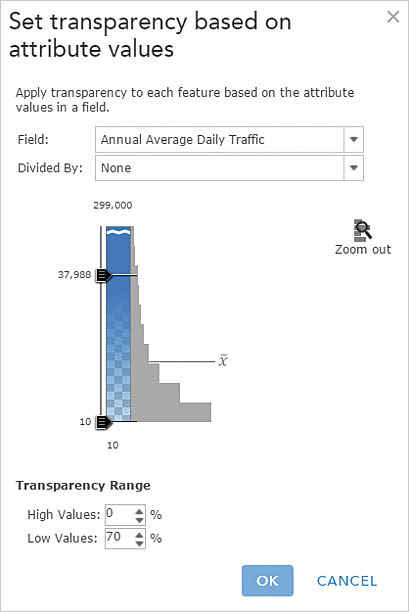 Choose an attribute field from your data to control the transparency, then adjust the transparency range as shown in Figure 6. 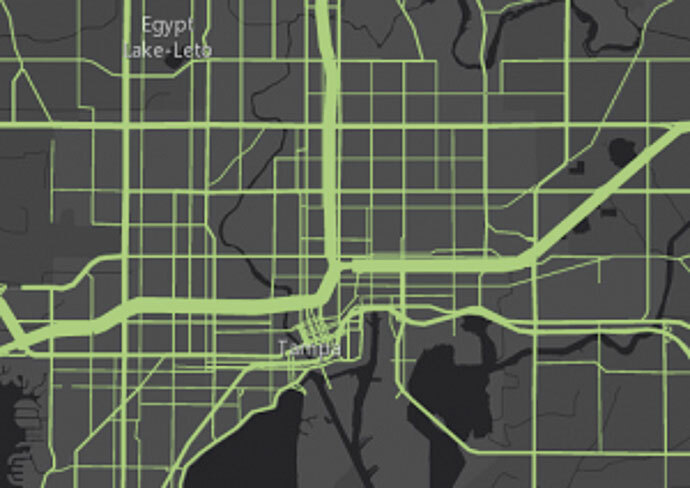 Using size and transparency highlights the busiest highways on the right-hand map. Figure 6: Subtle differences can be achieved using transparency. The map on the right employs attributes for size and transparency to make the busiest highways stand out and the roads with less traffic recede visually into the map. When starting a multivariate map, use a count attribute for the size and a normalized attribute for the color. This will help you see patterns more quickly. An example of a normalized field would be a ratio, average, or percentage. You can select a field to normalize your data from the options interface. See an example using count and color. In the past, showing two topics in the same map could be a challenging task. 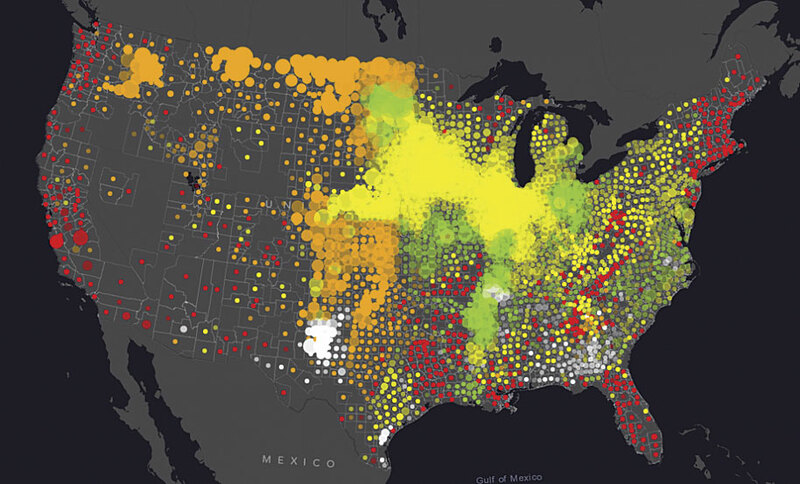 With smart mapping in ArcGIS, now you can easily show patterns using both color and size. Simply select the variables you want to view, and smart mapping will provide an option to show color and size. For example, if you want to explore the pattern of single-parent households, size can show the total numbers, while the color can highlight where the highest percentage exists. This technique pinpoints areas that have a high count and percentage of single-parent households. Figure 7: This election map shows the predominant count of votes in North Dakota voting precincts from the 2008 presidential election, with darker colors indicating a higher predominant vote for that party. Smart mapping has a built-in interface to help you pinpoint the largest value between multiple attributes. This predominance option allows you to quickly visualize predominant values without needing to calculate any fields in your dataset. In the interface, choose up to five numeric attributes that share a common subject of measurement. An election map is an example of a predominance map. An election map simply tells you which—of two or more candidates—has the highest total vote count. The map in Figure 7 does more. It shows the predominant count of votes in North Dakota voting precincts from the 2008 presidential election. Darker colors indicate a higher predominant vote for that party. Lighter colors indicate that party barely won the precinct. White represents a tie. With this map, a campaign manager can instantly see which precincts have a strong base for each party and which precincts were more contested.